First-year DVM students pose for a photo-op with Dean Willie Reed and their new stethoscopes. 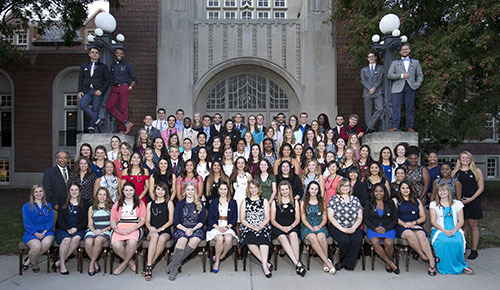 Members of the DVM Class of 2021 enjoyed a Purdue Veterinary Medicine tradition Thursday, September 7, when they attended the annual Stethoscope Dinner. Held in the Purdue Memorial Union, the event is co-sponsored by the Purdue Veterinary Alumni Association (PVAA), the Indiana Veterinary Medical Association (IVMA) and Patterson Veterinary. After remarks by Dean Willie Reed and representatives of the other sponsors, each student received a complimentary stethoscope. The event signals the start of the freshman classes' veterinary education. The Stethoscope Dinner concluded with the classmates gathering for a formal picture outside the entrance to the PMU Great Hall. There are 90 students in the DVM Class of 2021. Congratulations to all!